In this third (and slightly sentimental) part of the famous action series Murtaugh (Danny Glover) is soon to retire for an old-age pension. 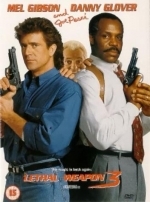 But in these several days left, he gets drawn into the arms theft investigation by his energetic colleague Riggs (Mel Gibson), and Murtaugh decides to serve further. Riggs meets Lorna Cole (Renee Russo) who practices the same semi-legal and sometimes crazy methods of work which Riggs prefer as well. - The magic is back again!